Have you ever wanted something so badly that you didn’t think you could live without it? You would spend your days trying to imagine your life with that special something. The things you would do, how you would react. It always seemed intangible and so out of reach, a pipe dream. Well, let’s consider that you DID get what you wanted. Did you behave in the way that you had envisioned? Did you do the things you said you would do? It’s very rare for me to want something so desperately that I feel like I could lose my mind and it’s even more rare for me to actually ATTAIN that something, but it did happen and on Friday the 13th no less. I’ve explained before how excruciating it is to get Davey to take a nap. This kid will go down at bedtime, but he fights daytime naps all the way. It’s like he’s afraid he’s going to miss out on something by taking a nap, and the problem is I can completely understand his thought. I’m not a big fan of naps myself. 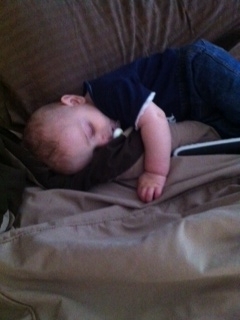 They seem so counterproductive, but I do realize the need for my 6 month old to have regular naps during the day. Unfortunately, it’s like pulling teeth to get him to realize that, but still I try super hard everyday and I’ve WANTED him to take naps more than you could possibly imagine. I’ve thought about what I would accomplish if Davey took substantial naps (and by substantial, I mean at least an hour per nap, preferably one in the morning and one in the afternoon). I could finish writing that book I’ve been working on for the last few years. I could get at least half of the house cleaned, including mopping the hardwood floors. I could weed the flower gardens out back. I could do my little home improvement projects. The list of possibilities is endless. Needless to say, I don’t actually get to accomplish too much of this since my son won’t nap. Friday morning; however, there was a change of the tide. Usually Friday the 13th is bad luck, at least for those of us who are superstitious, but it seems to have the reverse effect in my household. Davey fell asleep in my arms as I was feeding him, so I brought him upstairs and put him in his crib. I turned the baby monitor on and took the opportunity to hop in the shower. Well, hop in the shower was about all I was able to do. I didn’t even get the chance to shave my legs (meaning: I couldn’t wear shorts). Davey started screaming, which is par for the course with him where naps are concerned. I went into his room, took him from his crib, made sure he had his pacifier and brought him into my room. I placed him in my unmade bed and went into the bathroom to finish getting ready (I at least wanted to blow dry my hair). My bathroom has a double door that opens from the bedroom into the bathroom. From my vanity, I have a clear and unobstructed view of our bed. I turned the blow dryer on and watched as Davey rolled onto his side, resting his head on his daddy’s pillow. He watched me wide-eyed for a few moments, but then his eyes started to slowly close and within minutes he was fast asleep. I almost wanted to scream with excitement! An hour passed and I was able to finish getting ready, fold 2 loads of laundry sitting in my bedroom, write a blog, read a few blogs, and drink my coffee in peace. Occasionally, Davey would move and I’d hold my breath wondering if my little reprieve from mommyhood duties would be coming to an end, but after each movement he stayed soundly asleep. Another hour passed and I’d caught up on Facebook, started reading a new book, read an article in Vanity Fair, and packed up Davey’s clothes that had gotten too small. I’d been pretty productive, but what I really wanted to do was go downstairs to clean the kitchen and iron some clothes, but I was afraid to leave a sleeping 6 month old on my bed. What if he rolled over and fell off? I started pacing the room, feeling like a caged animal, wishing and hoping that Davey would wake up so that we could go downstairs. And then at that moment, I really wanted to beat myself. I’d spent months complaining and whining about my son who wouldn’t nap and that I couldn’t catch a break or accomplish anything. I’d prayed for him to nap so much. I’d wanted it so badly, I could scream and here it was…my wish come true and yet it wasn’t good enough or perhaps it was too good. Could my son be a napper after all?